Hello! Merry Christmas Eve Eve to you all! I just wanted to pop in to post a card that I made today and to wish you all Happy Holidays! 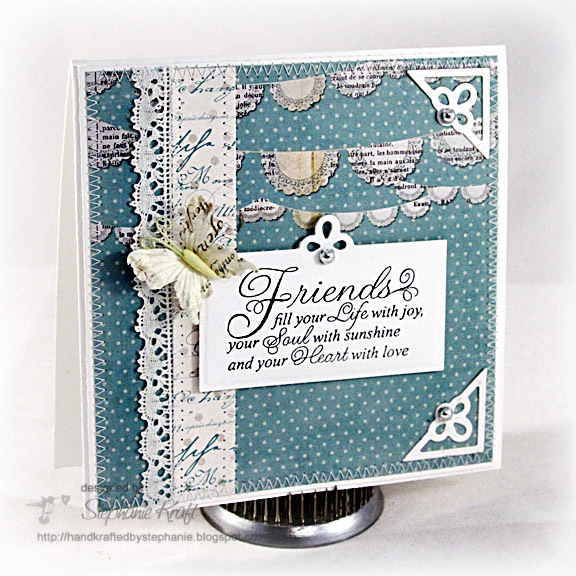 I was inspired to make this friend card using this lovely sentiment from JB-09220 Friendship Nested Sentiments & Verse. I paired it with some paper from Parisian Anthology (Pink Paislee) and some Maya Road lace. My sentiment and corner embellishments were cut out using JB-08955 Nested Sentiments Dies, one of two newly released Spellbinders custom die set designed to perfectly fit all JustRite Nested Sentiments & Verse stamps! I want to thank you all for stopping by and wish you the happiest of holiday seasons and many blessings in the new year! Accessories: Lace (Maya Road), Butterfly (Prima), Silver pearls, Foam tape, Thread, Sewing machine. Ohhhhh!!!! I just LOVE this!! wow!! Stephanie... So sorry to hear that you have lost some special people in your life this past year. Here is wishing you a blessed new year and a very merry Christmas! Lovely card and a wonderful sentiment! Stephanie, sorry to hear you lost your sweet friends. May your memories of them brighten your days and I hope it also places a smile on your face!!! Your card is a gorgeous reflection of what they have meant to you!!! Gorgeous, Stephanie! Pretty colors! Wishing you and your family a wonderful Christmas!